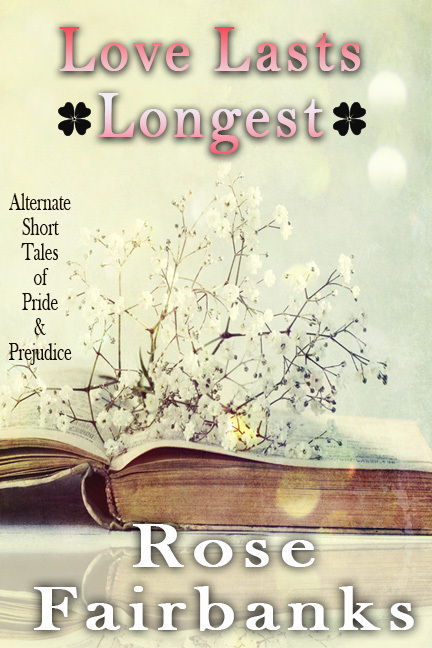 Love Lasts Longest- Excerpt and Giveaway! I’m so excited to announce the release of my latest book, a collection of short stories! They were loads of fun to write and I think you’ll enjoy reading them too! As a busy woman I’ve got so many things to do when I get a break in the day it’s not for very long. I was always the type to have a book at my side, even while waiting for the doctor, but I HATE having to put it away. I ALWAYS get interrupted at the good part!! These short stories are designed to fill those few moments of quiet time you have when instead of playing candy crush or thumbing through a left over magazine caked in germs, you can dive into the world of Darcy and Elizabeth for a quick swim of refreshing romance. Here’s an excerpt from Tolerable Feelings. Blurb for Tolerable Feelings: When Charles Bingley accidentally tears Jane Bennet’s gown at their first encounter, they must wed to save her reputation—or so Mrs. Bennet says. What can it mean for Darcy and Elizabeth if the issue of Jane and Bingley’s marriage is not a source of disagreement? Instead of replying, Caroline declared a desire to perform on the pianoforte. After she left, Darcy took her place and spoke with Elizabeth. “Did you enjoy the evening?” They had just returned from a ball in Town and now were having a light supper at Jane and Bingley’s house. “It was certainly tolerable.” Darcy grinned, and Elizabeth smiled at the sight. She could not understand why he was never provoked by her teasing but was pleased she could always humour him. “Certain friendships easily inspire jealousy,” he said gravely, and when Elizabeth turned to see his face, she was surprised to see an unmistakable look of admiration in his eyes. She said nothing as her heart beat faster. Surely he could not be implying he cared for her! Why, they had been friends for months now, and he never said a thing! Elizabeth smiled. Darcy’s presence would be an agreeable addition to what otherwise would likely be mostly ridiculous company. They moved to the coffee table to refill their cups. Before Elizabeth could make sense of why the candles all seemed to burn brighter, the music sounded sweeter, and all the company more enjoyable, Darcy was making his apologies to his hosts. Unaware of her eagerness to catch one last glimpse of him, her eyes locked with his before he left with a slight smile on his face. Ah! So sweet! But can it really be that simple for them? You’ll have to find out what happens in Kent! Amazon is still working on linking the pages, so for now it’s separate. It is in the Kindle Unlimited program, which means I can’t sell it on other vendors for 90 days. I’m giving away 2 ebooks, open international. Comment below to be entered. Entries close Sunday, September 27, 9:59 pm EST. It’s not a lot of time, but I’m going to be out of town all of next week and want it taken care of before I leave. ← Sketching Character- Author Interview with Pamela Lynne and Giveaway! I’m really excited about this one. Short stories are currently the balm for my college homework full time working budget girl soul. LOL I am trying to make myself wait until it’s on Nook to buy it because if I put my credit card back on Amazon we know what will happen… O:-) Thanks for the blurb I love it!! Oh! Sounds so good! I’d love to win a copy! 🙂 Thank you for the excerpt! Loved the excerpt thank you. I really look forward to reading this book. Sometimes a short story is just what is needed and when they are about Darcy and Elizabeth in love ❤ well that’s perfect. Thanks for the giveaway. I never get enough of ODC…so I will be looking forward to reading this. The excerpt was delightful. Thanks. Thanks so much for the tease. It sounds very good. Looking forward to reading it. I absolutely love the excerpt from Love Lasts Longest. I think Mr. Collins and Lady C will both cause problems, perhaps instigated by a jealous Caroline. Thank you for the generous give away Rose. Wow! This sounds just delightful! Very much looking forward to reading this. Can’t wait to find out what happens in Kent. Such a teaser! Sounds great. Sometimes I like a long, involved story and sometimes a quick read where you don’t have to wait for the happy ending. Thanks for the chance to win! I may have to quit working to catch up with all the stories… please enter me in your giveaway! The excerpt is so lovely and touching. Thank you very much for offering the e-books, Rose. Oh it sounds great. No Jane/Bingley obstacle but the excerp made me curious as to what will happen in Kent. And partly a crossover, too. Very promising. I’d love to read it. I love how you write! I can picture what I read happening in my mind perfectly. Ooooooooooooooh! it is so nice!! Lovely lovely!! or with Sir Lucas words: capital capital!! Fantastic excerpt Rose. I definitely NEED to read more! Short stories can sometimes be just the thing if you want a quick taste of JAFF and for whatever reason, can’t invest the time in a longer work. And did I see mention of Colonel Brandon? I love crossovers! I can’t wait to read this one. Off to put it on my wish list! Loved the excerpt. .. can’t wait to read it! Would love to be put in the drawing. Love all your books! Lovely! A crossover too?! Thanks for the excerpt and the giveaway.